If you have decided to become the owner of one or more micro, teacup, or some other small-sounding name for potbellied pigs, remember that these names are slightly misleading. 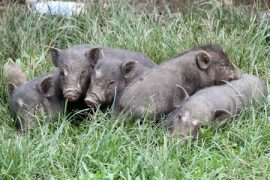 While these pigs will never reach the size of commercial hogs, which can weigh between 600 and 800 pounds, these cute little animals can quickly grow to the size of a 50-pound Pitbull or even as large as a Great Pyrenees. Potbellied pigs can make for loyal, smart, and loving companions, and with regular vaccinations and solid health care, they can avoid many of the health problems typical in a potbellied pig. Even so, many individuals take on these pigs without understanding what they are up against, so here is what pet owners can expect. There are likely few things pigs won’t eat – hence the less-than-kind phrase “eat like a pig” – and potbellied pigs are no different. Not only will obesity lead to health problems in potbellied pigs, but it would also leave them more susceptible to heat exhaustion if left outside or in a home without air-conditioning in hot temperatures. To avoid this, pet owners should feed their pig a diet formulated specifically for a potbellied pig and not a commercial hog. The occasional vegetable or fruit treat is fine, but it should not be overdone. As well, do not do the opposite and underfeed a pig in order to keep it “miniature” – plenty of alleged “miniature” pigs are in fact starved pigs. Veterinarians should have recommendations for feeding plans for potbellied pigs. Potbellied pigs are susceptible to nasal and respiratory infections, especially atrophic rhinitis, which causes infected pigs to experience a constant running nose. Critically infected animals could discharge blood out of the nose, which could lead to permanent nasal defects. Fortunately, this condition is largely prevented through regular vaccinations. Pneumonia can also affect them—should a pig start coughing, appear lethargic, and spike a fever, the animal needs veterinary attention immediately. Aging pigs can experience arthritis, which is another reason for preventing obesity since there would be less stress on the joints. When a pig is showing signs of lameness, a vet can prescribe pain relief medication for the inflammation. This condition can often affect potbellied pigs, such as when a pig doesn’t drink plenty of water, but it may also happen if the animal eats a foreign object. Pet owners should always provide their pig with water—they can flavor it with juice if the animal isn’t drinking enough—and they should take their pig to the vet if it is still having problems. Prolonged straining could lead to a rectal prolapse and require surgery. Any type of skin problem can affect miniature pigs, such as sunburn when left outdoors on sunny days. As well, melanoma can occur in pigs, so the animals should go to the vet at any sign of growths. Pet owners also often report seeing itchy, dry skin on their pigs, which can be alleviated with mild moisturizing lotions. For scratches and cuts, pet owners can use wraps and Manuka honey to prevent infection, but they should take their animal to their vet as a precaution if the wound bled a lot.